North Regional Voting Deadline: 11:59 p.m. (PST) TONIGHT,Sunday, March 6. 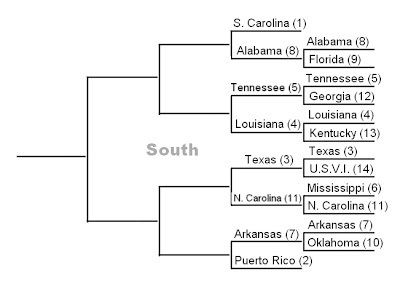 For the most part, things went according to the brackets in the opening round of the South Regional. After trailing early, for instance 8th-seed Alabama came back to defeat 9th-ranked Florida easily, 20-11. That earns 'Bama the dubious pleasure of pairing off against first-seed powerhouse South Carolina in Round Two. The fifth-seed flag of Tennessee has its detractors, but they didn't stand in the way of its laying an absolute beating on The Peach State, 33-1. While Georgia takes the bus home, Tennessee advances to meet fourth-seed Louisiana, which easily took care of business against Kentucky in the first round, 28-6. There was no surprise either in the Texas/U.S. Virgin Islands matchup, where the Lone Star State trounced the region's bottom seed, 25-6. 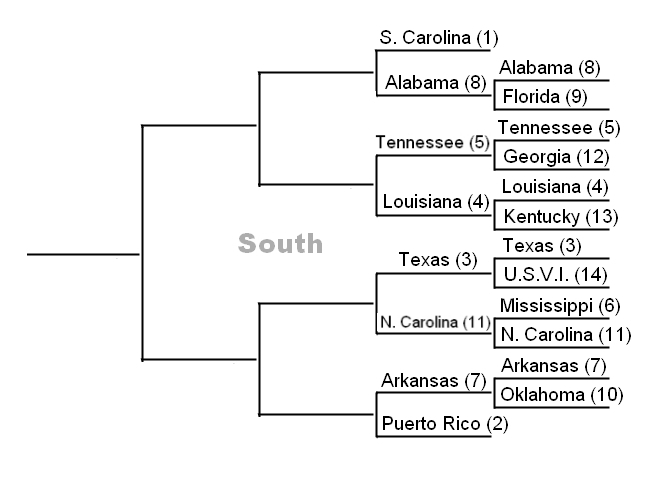 The Mississippi/North Carolina matchup, however, provided the South Regional with its first hint of Cinderella-story potential, with North Carolina knocking out sixth-seed Mississippi 17-12 despite an official blunder in which an inaccurate image of the flag was initially posted. In later questioning, the responsible party admitted to "being from the West Coast." The Tarheels will take on the Texans in Round 2. In the closest match of opening day, seventh-seed Arkansas held off Oklahoma 16-14 in a contest that literally went down to the final vote. This finish paves the way to an all red, white, and blue showdown this Tuesday as Arkansas takes on second-seed Puerto Rico.